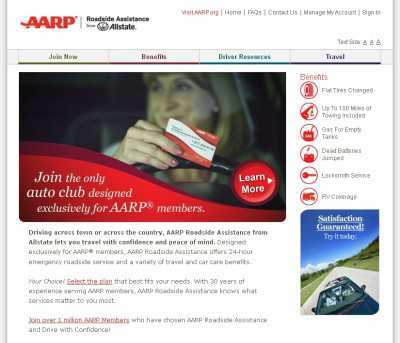 AARP Roadside Assistance is presented by AllState, and it stands as one of the most complete and interesting assistance programs for drivers in the United States. There are four levels of membership, and each gives you a different number of benefits, but (basically) you’re getting 24-hour emergency roadside assistance wherever you are in the country. 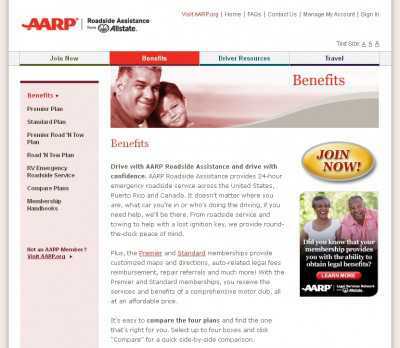 As you can read on AARPRoadside.com, the four programs are “Standard”, “Premier”, “Road ‘N’ Tow” and “Premier Road ‘N’ Tow”. Some of the differences between the “Standard” and “Premier” plan include the amount you’ll be paid if your car is robbed, and the number of miles your vehicle will be towed at no cost. Still, the bonds paid by both plans are exactly the same: you get a hospital emergency room bond of up to $1000, and an arrest bond that also amounts to $1000. Other notable difference between plans includes the amount you’ll be paid if your trip is interrupted: $375 if you have signed up for the “Standard” plan, and $750 if you have premier membership. And if you have the “Standard” plan, you won’t be paid for mechanical failures, only for collisions. You must sign up for the “Premium” plan for all hazards to be covered. The fees are different if you are traveling on your own, and if other people are going to be traveling with you. On this part of the site you can see the fees that apply to singles, and the ones that couples and families must pay.